With the prospect of a long sunny day ahead of us we made the hour long drive over to Crummock Water for today’s walk. We have been looking at a number of fells which we haven’t set foot on for quite a few years and thinking that we really ought to make some return visits. The main reason for not having done so is that many of them are some distance away from where we live so a long drive has to be taken before we can even set foot on any of them. The amount of available daylight and weather conditions have also to be factored in, together with day to day routine commitments/arrangements, so the number of occasions when all the pieces of the jigsaw fall into place tends to be few and far between. Today just happened to be one such day so off we went, we parked up at Lanthwaite Green, had a picnic breakfast, after which we kitted up, and off we went – a t-shirt and shorts day right from the start. From the parking area, a view of Whiteside with the smaller subsidiary peak of Whin Benn just below it. The overnight inversion, which was thick and dense when we left home in the east of the county, is just beginning to evaporate as the sun gets higher and the day begins to get warmer. The parking area is just across the road on the right where its just our car and two others at the moment. The driver of one of the other two cars was just starting out as we arrived so no chance to exchange greetings, and the occupants of the other car are nowhere to be seen. I crossed the road to look towards Buttermere for this shot of the Red Pike to High Crag range. You can just about make out the three cars back there in front of the trees, ours is the one on the left, this is a look back as we were walking across the green and making our way towards Gasgale Gill. Behind the trees Mellbreak is catching the morning sun. A look back at the inversion which is gradually beginning to dissipate, and a shot of the bridge which replaced one swept away during one of the winter storms a few years ago. We begin our steady walk up Gasgale Gill, although the water flowing down it is called Liza Beck. The beck has many attractive falls and cascades along its journey, all of them dropping into inviting little pools, which on a hot morning were proving to be more than a little tantalizing. We admired and enjoyed them but it was too early to indulge. The first part of the walk up the gill is a steady climb along some quite rough and narrow paths, and it feels very enclosed, so the combined effect of climbing over the rough ground and the lack of air movement along this stretch made this very warm work indeed. Eventually, after an especially awkward scramble over an obstacle known as the ‘rock-step’ (a large vertical slab of smooth flat rock which has very little by way of hand or footholds), the gill becomes flatter, wider and has a much more open feel to it. There was certainly a lot more air around along this section which helped to cool things down a little. Ahead of us we are beginning to see the Hopegill Head end of the ridge. Across the beck I noticed this old sheepfold, and probably it used to serve as a washfold too, given its proximity to the beck. Inevitably, after the ease and tranquility of the wider and flatter middle section of the gill, the gradient gradually becomes steeper as it rises up to Coledale Hause and the path deteriorates once again. Certain sections of the path have been very badly eroded as a result of the storms, this was a particularly awkward section with lots of loose scree and bare rock on the steeply sloping gill sides and you really did have to watch where you were putting your feet across here. When Eel Crag comes into view you know that you aren’t very far from reaching Coledale Hause, a major crossing point, at the head of the gill. As the ground becomes steeper more cascades and falls appear as the water drops from one level to the next. Coledale Hause finally appears with Eel Crag and Crag Hill behind it to the right, and the tiny figures of the walkers passing across it. This is the last flat section before we have to tackle yet more loose scree and rock on the final uphill section to the Hause. I noticed a faint path on the grass on the opposite bank so it looks like previous walkers up here used the grassy side for as long as it was possible. If I hadn’t been so much higher than this very, very inviting pool I think I might have been tempted, it looked so clear and refreshing on such a hot day. The last section of the gill passes alongside this lovely cascade …..
….. which proved to be too much of a temptation and, on reaching a flattish piece of ground just below the start of the cascades, off came the packs, boots and socks. Sitting on the warm dry grass with our feet resting on the cascade’s flat rocks and feeling the cold water splashing over them was pure bliss. It did wonders for the recuperating foot too, which by now was aching quite a bit after dealing with all the rocks and scree on the way up. With newly refreshed and tingling feet we strolled over Coledale Hause to take a look at the view beyond it. In the middle foreground from left to right are Outerside, Causey Pike, Scar Crags and then Sail. Beyond them on the distant skyline are Clough Head and The Dodds. There was a very slight breeze along here too which was wonderfully refreshing and very welcome after the closeness of the gill. At the Hause we turn and take the path on the left, which is a lot steeper than it looks in this photos, leading up to Sand Hill and Hopegill Head. The path over to the right leads on to Hobcarton Crag and Grisedale Pike. A look back at Eel Crag as we make our way over to Sand Hill. To the right of Eel Crag are the craggy lower slopes of Grasmoor. A look back at Eel Crag with the summit of Crag Hill beyond it from the lower slopes of Sand Hill. We passed the time of day with the walkers below who were walking the Coledale Round. On such a beautiful day I had expected to see many more people up here, that’s not to say that there wasn’t anyone around but walkers were certainly few and far between. As we continued up to Sand Hill we only met two more walkers, each of them walking solo, and they weren’t the most communicative of blokes either. As we progress up Sand Hill we begin to see more of Grasmoor, the highest fell in the north western group of fells, with Liza Beck snaking round to the left of it and just about to disappear into Gasgale Gill. There was a slight haze around today but not enough to completely spoil the longer views, as we puffed, panted and sweated our way up Sand Hill we had a decent view of the Loweswater fells over to our left, the most prominent one being Blake Fell in the centre of the skyline. 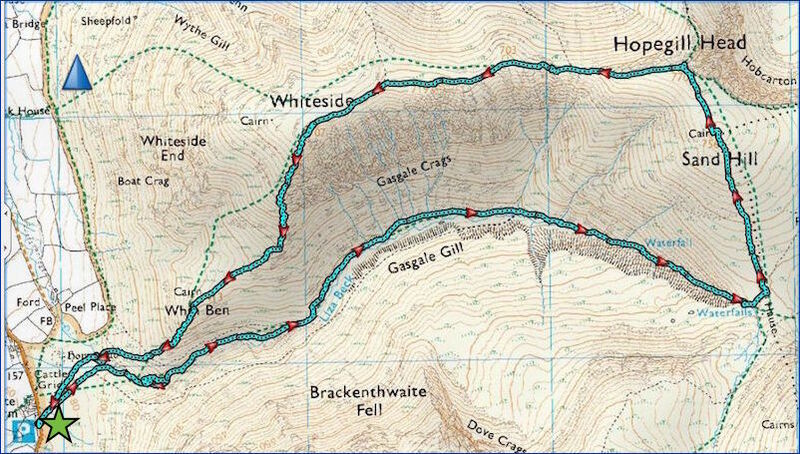 Time for a breather when we reached the top of Sand Hill and a chance to look back down at our route along Gasgale Gill …..
….. and a look ahead to the summit of Hopegill Head where a bit more uphill work will have to be done when we’ve got our breath back. A dizzying look down into Hobcarton Gill as we pass close to Hobcarton Crags, with Blencathra on the skyline behind Grisedale Pike. A lovely view down to Ladyside Pike from Hopegill Head summit. A summit photo before heading back down to those blue backpacks where we’re planning to sit on the grass and enjoy the sun, the views and our sandwiches. Another shot from the summit looking along the very steep Hobcarton Crags and over to the equally steep Grisedale Pike. Now its time to go and attack those sandwiches and drinks. We weren’t in any great hurry so we enjoyed a leisurely picnic, with only a handful of walkers passing by us, after which we packed up and set out along the ridge to Whiteside. We met just two walkers along here, a lady from Cockermouth with whom we had just a chat before I took this shot, and we were almost on Whiteside before we met the other walker, a solo male, who wasn’t talkative at all. Another shot of Ladyside Pike as we begin the ridge crossing. A look back at progress so far, Hopegill Head is to the left, to its right is Sand Hill and over on the far right is Sail. We need to take things steadily across the ridge and consider carefully what the recuperating foot can manage at the moment …..
….. and a look ahead explains why its necessary to be careful. The route is full of rocky ups and downs with plenty of loose scree paths. Even with two good legs and feet you need to consider what you’re stepping down onto, so with a foot that might suddenly give you a jolt of pain if you step on it too awkwardly it becomes even more important. A look back illustrates the point and there was no sense in taking undue risks so we skirted around this particular obstacle by taking a path around the side of it. We’ve reached a fairly level section so we take a minute or two to give the foot a break while we enjoy the look back at the long sweep from Hopegill Head down to Ladyside Pike. I turned the camera a little to the right for a closer view of the previous shot. We’ve made steady progress and, at another convenient flattish area where we gave the foot another break, I took yet another look back. Its a fascinating high level route with the views, in both directions, constantly changing. Here, on the right, we can see the top of Gasgale Gill, below Coledale Hause, with Crag Hill and Sail behind it. On the left the steep slopes of Hopegill Head, which look daunting from here, but which don’t feel at all daunting when you are walking over them. A look ahead from the same position and the route is becoming much gentler, the foot will be pleased about that! There goes the second person we met as we crossed over, he grunted some sort of a response as we said hello but it was obvious he wasn’t in any mood to chat. Of course, he had just dragged himself up the steep path to Whiteside so perhaps it was understandable. I think I’m standing on the East Top of Whiteside at this point but I didn’t request a gps check so I can’t be certain. If it was, it stands at 719 metres, or in old money 2359′. Anyway, its quite high whichever measurement you opt to use. The vertiginous drop down into Gasgale Gill. Mellbreak and Crummock Water start to appear and the summit of Whiteside is at last in view over on the right but …..
….. we’re not there yet! It looks as though there is a walker up there on the summit and if it was he/she didn’t carry on towards us and there was no-one else there when we arrived. Its definitely not the outline of a tree, that’s for sure. The pace has slowed now because the foot is aching, while I’m waiting …..
….. I take a look across at the northern face of Grasmoor with Dove Crags forming a precipitous perimeter above the deep bowl shape which is gouged into it. A look back from the West Top of Whiteside, not quite the highest point at 2320′ or 707 metres, and Wainwright acknowledged that it wasn’t the highest point, which is the East Top, but chose to select it as the summit in his guide to the north western fells. Its only a matter of a few feet between the East Top and the West Top and as far as I’m concerned it wouldn’t be something I could be bothered to argue over, the view is pretty much the same whichever one you’re standing on. Another rest for the foot and a slug of fruit juice for the pair of us before we begin to drop a couple of thousand feet back down to the valley. If it was a halfway decent path it would be ok, but it isn’t. Its steep, loose and rocky and with the foot now very weary it will be a slow and careful descent. As we descend I take another look along Gasgale Gill before this dizzying view becomes hidden by the fell side. I didn’t take many photos on the way down because the view doesn’t change and because I was in front picking out a decent line which wouldn’t be too severe or difficult for an aching and weary foot. Just below us is the subsidiary peak of Whin Benn, while far below are the fields of Lorton Vale, Crummock Water and Mellbreak. The haze has increased so the longer views beyond are much less distinct. The bliss of a flattish grassy area as we reach a little col below the tortuous descent from Whiteside. It looks straightforward looking back at it from this spot, but its a different matter altogether once you are on it and, in my humble opinion, is an absolute pain in the neck whether you’re climbing or descending. The view straight along Gasgale Gill from the little grassy col with more fruit juice taken on board at this point in readiness for the next section, look out knees and ankles, here we go …..
Just behind the rocky knoll, up there on the right, is where we stopped at the little grassy col. We skirted round the outcrop and began negotiating the narrow path through the heather. This is obviously less steep but the heather obliterating the path led to a few choice phrases being hurled at it. We’re down onto Whin Benn at last with a view down to the bridge across the beck and the car park over at the top left. We still have a good way to go but the roughest sections are behind us now and we are looking forward to getting down to the beck for another bout of foot spa treatment. A Hercules flew past at a leisurely pace, but this was the best of the handful of shots I took of it. Safely back down to the bridge with another walker enjoying a bit of a snooze in the sun just behind it. We crossed the bridge and made straight for the beck, found a handy rock each, where boots and socks came off, and hot feet were dangled in the cold water, utter bliss! Boots back on, although I didn’t bother with my socks, for the short walk across Lanthwaite Green back to the car park, from where, two tangerines later, I took this view of Grasmoor before we left for the drive back home. A good day out in beautiful weather, what more could you ask for?